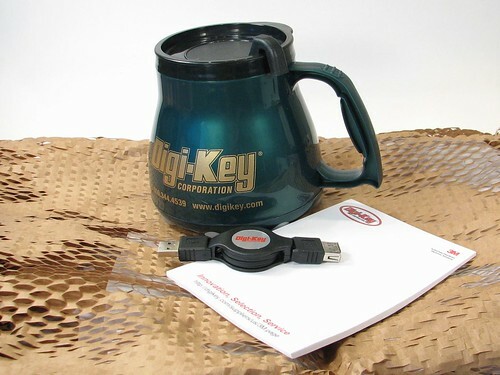 The other day I got a box of swag from Digi-Key. 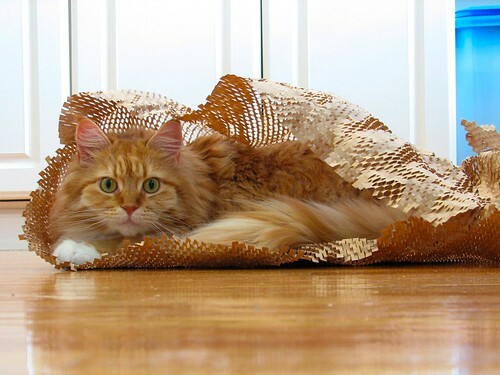 Each week, @digikey holds “Twrivia Thursdays” on Twitter, and a few weeks back they asked “What is the name of the recycled product we use for packaging?” I didn’t realize this was a contest, but I had to answer immediately, because we know it as one of the best cat toys ever! Anyway, I’m thrilled to have gotten my box of misc (and it says “misc” on the invoice) because it came packed with– surprise– that same packing material, Geämi, which the cats are playing with even as I type. This entry was posted in Everything Else and tagged cats. Bookmark the Permalink. "And here we see the final form of the Evil Mad Cat emerging from its chrysalis…"
Agreed. Our cats *crave* this stuff. The anti-static bags and tubes not so much. Which is fine, because that means that every box from Digikey and Sparkfun has a little somethin’ for everyone. Geämi, is it? I will be remembering this. Thanks!